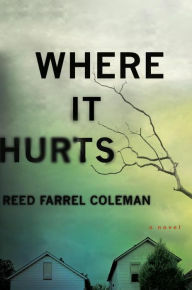 Where It Hurts by Reed Farrel Coleman is a very highly recommended detective novel and the start of a new series. Gus Murphy has had a bad couple of years and his life still seems to be spiraling downward. He was a Suffolk County cop, happily married with two kids and a house on Long Island, but after his son tragically, unexpectedly dies, his life is in shambles. Now he's retired from the force, divorced, and working as a security guard and courtesy driver for a run-down hotel, where he also lives. He's still mourning his son and the disintegration of his marriage and family. He tries to keep busy so he doesn't have to think. Thinking means remembering and Gus doesn't want to remember or think about what he's lost. When ex-con Tommy Delcamino finds Gus and asks for his help, he tells Gus it is because Gus is the only cop who he ever trusted. Tommy's son T.J. was brutally tortured and murdered, his body left in a vacant lot. The Suffolk County PD doesn’t seem interested in pursuing the case and Tommy wants answers. He offers Gus all the money he has. Gus's first reaction is anger, thinking that Tommy came to him because of his son's death, but later circumstances cause him to start asking a few questions and looking into T.J.'s murder. What Gus doesn't know until he is already involved in the case, is that he has inserted himself into a case where everyone seems to have something to hide. And it is becoming dangerous, even deadly, for anyone who asks questions or seems too interested in this case. Gus fights through his own personal demons and pain to find out what really happened. His investigation brings him into contact with a cast of bad, bad dudes and his life is on the line. Where It Hurts is a totally engrossing novel and portends a great new series that I'd certainly follow. Coleman does an excellent job with the character of Gus. He has captured the nature of a man who is in mourning and unable to move on with his life after the tragedy that struck his life until circumstances force him to start thinking and interacting with people again. This is a well written, descriptive novel with a tight plot, and plenty of action and clues to follow. The cast of characters, while long, are easy to keep track of because they are so well defined as individuals. The ending was great, with an eye for future investigations and maybe some healing for Gus. This is a winner for me and I'm thrilled that it is the start of a new series. Perfect stuck-overnight-at-the-airport book. You won't even know time has passed - but make sure you have another book with you because you're going to be racing through this one! Disclosure: My Kindle edition was courtesy of G.P. Putnam's Sons for review purposes.